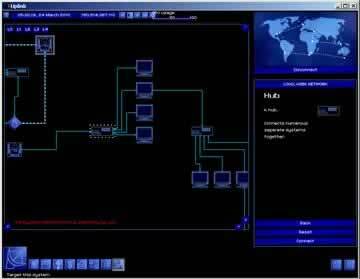 Uplink: Hacker Elite Game - Download and Play Free Version! Assume the role of an Uplink Agent and hack into the world's toughest computer systems! You are an Uplink Agent. You live through your computer. You hack into rival computer systems to steal, sabotage, launder, erase and frame. You use the money you earn to upgrade your systems, buy new software and configure new tools. More dangerous and profitable missions become available as your reputation and experience grows. 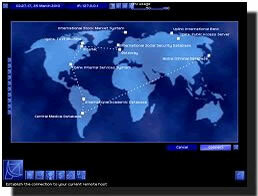 Just what can you do as an Uplink Agent? Speculate on a fully working stock market, or even influence its outcome. 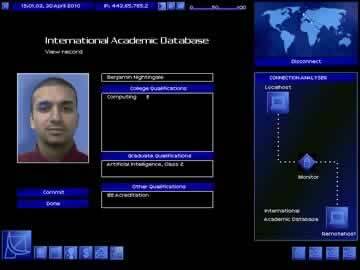 Modify people's academic or criminal records. Divert money from bank transfers into your own accounts. And even take part in the construction of the most deadly computer virus ever designed. After all, you are an Uplink Agent. And the world is at your fingertips. Crack a bank. Frame a rival. Crash the stock market. Forge or destroy evidence. The mission objectives are endless, and the choice is always yours. Feel the tension as you precariously infiltrate heavily-guarded databanks, and the panic as they trace your signal in real time. Let your morals guide you: Save the Net or melt it. Aid your allies or throw them to the digital dogs. Two totally different paths to elite hacker status lie before you. Which will you choose? Will you stop the deadliest virus in the world? Or will you help it along its destructive path?